Iranian Telecommunications Minister Mohammad Javad Azari Jahromi has revealed that the number of Telegram users in Iran was back on the rise three weeks after the state banned the messaging app. Three weeks after Iran banned the widely used Telegram messaging app, the telecommunications minister posted a chart online showing that the number of Iranian users had begun rising to pre-ban levels. The posting marks the first time an Iranian official has presented figures implicitly confirming the failure of state censorship policies. In an accompanying caption, Jahromi stated that the number of Telegram users in Iran had initially dropped when the ban was first imposed on April 30 but the numbers began to rise again from May 13-17. Telegram had reported 40 million users in Iran before the ban. Online content and social media apps are heavily censored with some sites and apps completely banned in Iran but Iranians with access to online censorship circumvention tools, such as Virtual Private Networks (VPNs), can use the tools to bypass the bans. State bans on popular apps are usually followed by a surge of downloads of such tools. 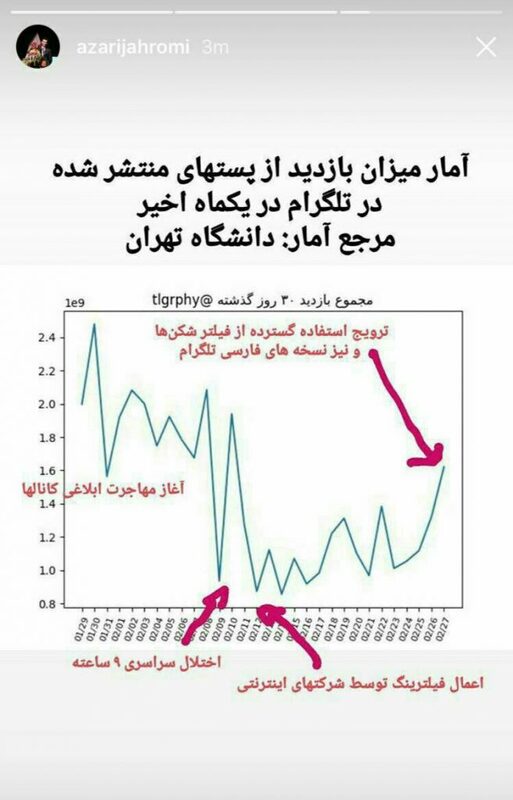 After Jahromi posted the chart, Assistant Prosecutor General Abdolsamad Khorramabadi warned Iranian businesses to stop their operations, such as the marketing of their services, on Telegram. With Telegram now completely banned in Iran, the authorities hope Iranians will use domestic messaging apps instead, but the citizenry has shown little appetite for domestic versions, which the state can access and monitor. President Hassan Rouhani was twice voted into office promising to improve access to information and internet freedom in the country. But state officials, including those in his administration, have continued to take actions restricting online content to state-approved content. For example, the state is expanding and improving the quality of domestic search engines, developed as part of the National Information Network (NIN), in order to block access to foreign search engines. These domestic Iranian search engines systematically filter keywords and phrases—and send users to sites that deliver only state-approved and sometimes fabricated content. NIN tools and services also facilitate the state’s ability to identify users and access their online communications, deeply compromising user privacy and security.